Henley Rowing Club scored a dozen wins at Weybridge Ladies Regatta on Sunday. Competing in the sunshine over a 900m course, Henley Juniors and Masters crews looked to continue their highly successful season against a range of clubs from the south east. In the J13 age group, the squad won three events. The double of Phoebe Fletcher and Emma Gray won in style beating a double from local Lady Eleanor Holles School comfortably. In the J13 girls coxed quad A division, Henley won convincingly against another LEH boat. 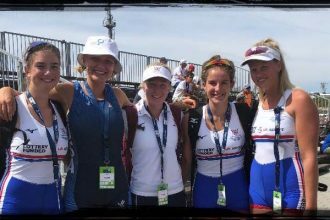 The crew of Amelia Crick, Jess Arlett, Sophia Hahn and Felicity Parfitt with cox Emilene Warner were racing together for the first time this season and were delighted with their win. The J13 boys coxed quad had to wait for the last race of the day to compete for their medals. Against a strong crew from Staines Rowing Club, the Henley boys showed great determination to win in a hard fought race. In the J14 age group, the squad won three events. The older J14 boys coxed quad of Anthony Howe, Cameron Jones, Nick Spicer and Jack Broadbent with Bruce Turnell as cox cox dominated the competition to win their second regatta trophy of the season. 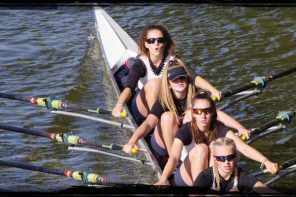 In the girls WJ14 coxed quad event, the Henley crew continued their season’s winning track record and scored another victory. The quad then split into doubles, and the crew of Lottie Orr and Issy Jonsson recorded their second winners medal of the day. The WJ15 girls entered seven events, and came home with six wins. The WJ15 coxed quad of Ella Morgan, Clare Pearson, Katy Claridge, Florence Wiggins and cox Rebecca Lister dominated their event and won their final easily against Maidenhead Rowing Club. In the WJ15 singles, Katie Beale and Hannah Gutteridge competed across two divisions, with Beale winning comfortably. In the WJ15 doubles, the Henley girls entered two divisions, and won both. The double of Lily Stimpson and Anna Roe reached a final against Shiplake Vikings and won with a good demonstration of sculling. The second double of Ella Morgan and Florence Wiggins also raced to their final easily. Racing another Shiplake Vikings crew, the girls scored the second win of the day against their local rivals. The Henley WJ15 girls also raced in two senior categories. 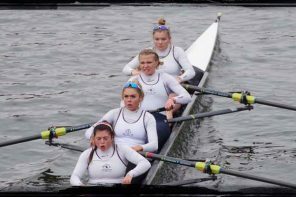 In the Women’s Novice coxed four, the crew of Alicia Redman, Clare Pearson, Katy Claridge, Ella Wandless and cox Rebecca Lister won against Staines in their semi-final to reach a final which they won convincingly. In the Women’s IM3 doubles event, Katie Beale and Iona McNab came home with another set of winners medals. Henley Women’s Masters were also racing at Weybridge. 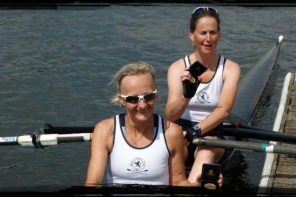 The double of Karen Edwards and Nikki Orr were competing for the first time since joining Henley Rowing Club as beginners last season. The double reached their final to race against an older crew from Tideway Scullers. Given a 18 second handicap, the Henley novices raced well and made up 10 seconds over the short course, but unfortunately were unable to take home winners medals from their first competitive outing. With 12 victories from the regatta, the Henley contingent were thrilled to be presented with their winners medals by Sir Matthew Pinsent.